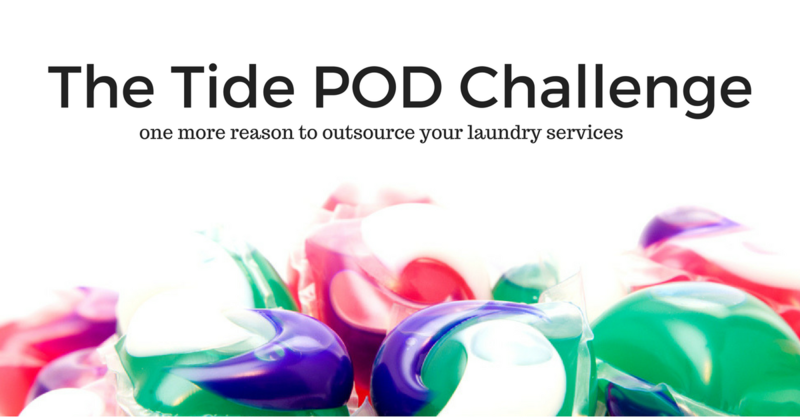 If you stay up to date with current trends and memes, you may have heard of the recent challenge teenagers and young adults are taking – the Tide POD challenge. If you haven’t heard of it, then you’ll probably be surprised to learn that teenagers have actually taken it upon themselves to eat laundry pods. Sounds ridiculous, right? And even worse – this scary social media trend can actually impact your business. Ingesting laundry pods is now “cool.” If your business uses laundry pods for its laundry needs, your employees or friends and family who frequent your business may try out this trend. This puts your employees at a great risk for danger. The idea of a teenager intentionally ingesting a laundry pod for fun seems absurd. You may be wondering why anyone would do this and where this challenge even originated. Laundry pod ingestion has been a huge concern for many for a while – as children may think the colorful pods are candy. Jokes and memes began spreading across the internet talking about how delicious the pods look. Some of the original jokes came from a child’s perspective but eventually turned into a joke about teenagers and adults craving the “forbidden fruit” as well. But this joke then was taken to the next level. Instead of just talking about people eating Tide PODs, the joke turned into people actually putting the laundry pods in their mouths and biting down on them. Why would anyone actually take the Tide POD challenge? We can’t really say for sure why kids would subject themselves to the danger of Tide PODs. But we can propose some theories. It may be out of sheer lack of knowledge regarding the toxicity of the laundry pods. Because the detergent in Tide PODs is extremely concentrated, just one pod is much more toxic than an equivalent amount of liquid detergent. On top of this, teenagers may be putting the laundry pods in their mouths to get social media views. We doubt they’re just eating laundry pods for pure fun. Teenagers will often publish videos of themselves eating pods. Many of these videos have gone viral. Even if teenagers may know of the dangers of eating laundry pods, they may not think they personally are subject to this danger. This is because most of them are not actually swallowing the chemicals, but biting down on the pods and then spitting them out. Even so, they’re increasing their chances of swallowing dangerous chemicals that will burn the esophageal lining in their throat and potentially cause a host of other serious health problems. Is anything being done about the Tide POD challenge? Rumor has it that Procter & Gamble is discontinuing Tide PODs to prevent any further danger to the public. This rumor comes from an image of a tweet from Tide that is circulating around the internet. But this rumor is false – the image is fake. YouTube is doing what they can to take down any videos of teenagers ingesting the laundry pods, with concern that these videos will influence other teenagers and younger kids to subject themselves to this danger as well. If your employees, friends or family take care of your business’ laundry needs, then they’re frequently exposed to detergents and other dangerous materials. So, what can you do to avoid the negative impacts of the Tide POD challenge? Your first instinct may be to conduct training or confront your employees regarding dangers on the job. While you should do this, you may not actually prevent your employees from taking the Tide POD challenge. Let’s face it – detergent is a dangerous substance. Therefore, it’s best to leave your laundry needs to the experts. This way you don’t need to worry about employee harm and losing money on wasted supplies. Outsource your laundry needs to experienced, professional linen rental and commercial laundry facilities. At Linen Finder, we help connect you with a quality laundry company in your area. Simply give us a call at 888-770-2489 to get connected with a provider in your area. Don’t leave it to amateurs to do your laundry. Save money and keep your employees safe with a quality commercial laundry company.